Find out what a badly-sourced article in the Toronto Sun, a fake list of grunge slang in the New York Times, and an oft-repeated anecdote about a floating bordello can tell us about better evaluating sources and looking at how we know what we know. 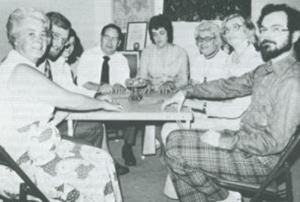 Some reflections on giving tours, ghost tours, and how the Philip experiment is kind of like Dungeons and Dragons. 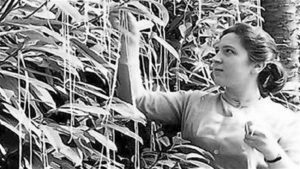 On April 1st, 1957 a BBC One news program ran a straight-faced and ostensibly real report on Switerzerland’s spring spaghetti crop, and convinced some of their viewers that spaghetti grew on trees. 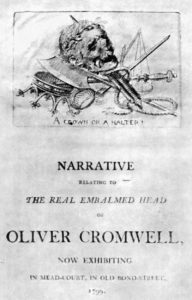 When he died, Oliver Cromwell was embalmed and given a funeral befitting a head of state. However, upon restoration of the British monarchy, Cromwell was exhumed and given a postmortem execution. His severed head was placed on a spike over Westminster Hall, and for twenty years his dead visage leered down upon London. The head was eventually dislodged by a storm, and for years it found itself in the hands of several owners, exchanged for debts, exhibited as a curiosity, and passed around at drunken parties. There’s no shortage of things on old maps that turned out to be fictional. Regions such as the Mountains of Kong or the continent of Lemuria dot antiquated maps, and the obviousness of their fictional nature seems quaint today. However, some fictional features of old maps were more subtle. 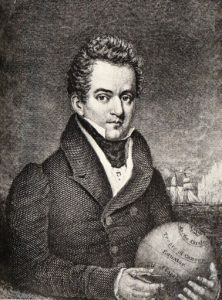 Benjamin Morrell was an American sailor in the early 1800s who, in his memoirs, A Narrative of Four Voyages, invented islands out of whole cloth, most prominently Byers Island in the Pacific, and New South Greenland, a nonexistent region he placed off the coast of Antarctica. For about 250 years, Europeans thought that giants lived in Patagonia. The inventor of this myth was Antonio Pigafetta, a member of the Magellan expedition who, in his memoir of the circumnavigation, reported seeing a huge man approximately ten feet tall. 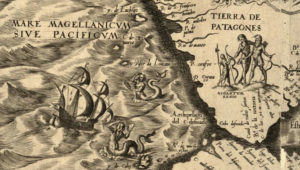 Later European accounts of Patagonia repeated tales of immense people living there, and Patagonian giants were a common illustration on maps from the 1500s until the late 1700s. There are (obviously) no giants in Patagonia, but the native Tehuelche population are some of the tallest people on Earth. 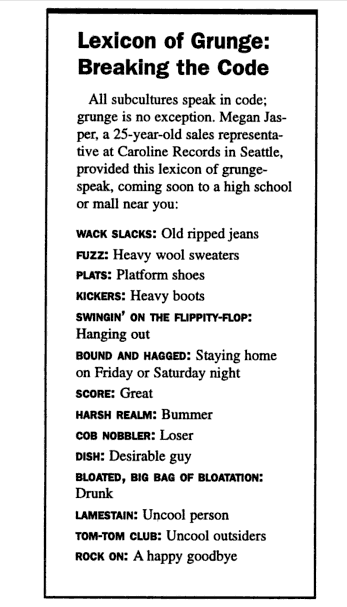 However, they average only about six feet, not a towering ten. Decades before the modern versions of the Democratic and Republican parties formed, the US also had a few other major political parties. One was the Federalists, led by Alexander Hamilton and John Adams. Another was the Whigs, who had intermittent success before collapsing in the middle 1800s. Out of the ashes of the Whig party two other parties rose to take its place: The anti-slavery Republican party, and the anti-immigrant American Party, better known as the Know-Nothings. The Know-Nothings opposed immigration to the United States, particularly from Catholics. Anti-Catholic paranoia has a long history in the US. Catholics (the thinking went) were more likely to be loyal to the pope than the country they lived in, were unable to work with people whom they deemed to be “heretics” and were, in general, less hardworking and virtuous than their fellow Protestants. 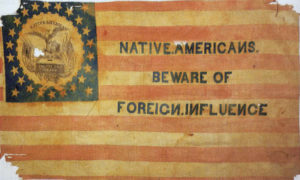 This xenophobia, paranoia, and bigotry was prevalent enough that in the election of 1856 the Know-Nothings would contend as a major political party, albeit a failed one. 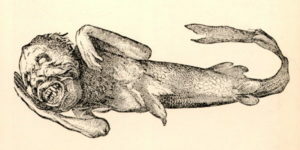 The fate of the mermaid is unknown. It was possibly destroyed in a fire, but Harvard University’s Peabody Museum of Archaeology and Ethnology has a specimen that is, possibly, Barnum’s original. After Barnum several other sideshows, museums, and curiosity shops copied the mermaid, and today many is the tourist trap cabinet of curiosities sports the horrific corpse of a monkey glued to a fish. As far as your humble podcaster is concerned, pasta is a wonder of the world right up there with the Pyramids and the Internet. We don’t exactly know where it came from, though. In the United States Pasta is often erroneously identified with Marco Polo. Supposedly, Polo brought back a variation on Chinese noodles from his travels, and introduced it to Italy. This story originates, though, in the United States. In 1929 a publication called the Macaroni Journal invented the Polo story, and ever since then that myth has refused to die. Some Italian sources claim that pasta originated with the Etruscans, a pre-Roman civilization on the Italian peninsula, but evidence for this is spotty. It is more likely that pasta originated in the Middle East and traveled to the Italian Peninsula via the Emirate of Sicily. No one knows who wrote The Travels of Sir John Mandeville. There is no record of an English knight alive at the right time with that name who could have written it. One oft-repeated theory is that Mandeville retired to Belgium, lived under a pseudonym, and only confessed his authorship of the Travels on his deathbed. Other than the uncorroborated word of a Liege notrary, though, we have nothing to substantiate this theory. What we do know is that the work was not wholly original, and combined elements of several pre-existing fantasies and romances into a single narrative. And, despite or maybe because of the fantasy elements, it did so well. It remains a fascinating look at what it means to encounter the unfamiliar, to travel, and to see the world that lies just beyond the lands you know. 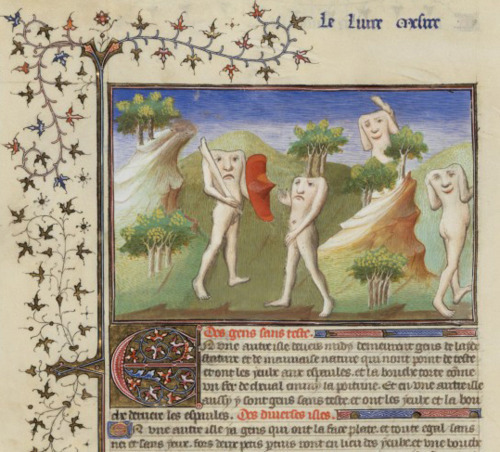 As the Travels of Sire John Mandeville move away from the familiar and the Holy Land, they get progressively more bizarre. The laws of convention and even reality seem to break down as Mandeville encounters cannibals, dog people, weaponized elephants, and headless humans who have faces on their chest. In one particularly striking passage Mandeville says that not only is the world round, but that one can circumnavigate it, and he also characterizes the Kingdom of the Great Khan as perhaps the most advanced nation in the entire world. The book ends with description of the Earthly Paradise, the one spot on the globe that Mandeville, despite all of his experience, cannot reach. Supposedly, The Travels of Sir John Mandeville is about an English knight who sets out for the Holy Land in the 1330s. 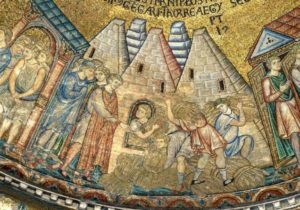 However, the journey to Jerusalem and the surrounding environs are only a small part of a larger narrative that involves fantastical creatures, foreign kingdoms, and wonders both inspiring and gross. During the first part of his journey Mandeville describes the life and religion of the Greeks (including their opinions on beards), a woman who was turned into a dragon (and the knights who failed to save her) and the temple of the Pheonix. That’s only the beginning, though. Next week, we’ll stay with Sir John Mandeville as he ventures further into the unknown and into even more bizarre foreign lands. Among the pseudohistory of Mandeville’s travelogue is the theory that the pyramids were meant to store grain, pictured below. You’ve probably said it. Or, you’ve been in a conversation and you heard somebody say it. Or you’ve seen it written somewhere. 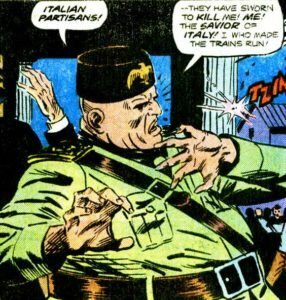 This cliche has been repeated time and again in countless different media (such as in the panel below, from DC’s New Earth series) to the point that one is almost more likely to associate the Italian dictator with railways than with the fascist ideology he invented. However, the commonly repeated trope does not have a basis in fact. Supposedly punctual trains were part of Mussolini’s propaganda machine that put up a facade of well-functioning infrastructure for foreigners, suppressed reports of train collisions and accidents, and took credit for improvements implemented by earlier democratic regimes. There was no real bright side or silver lining to the authoritarian dictator’s reign. Not even well-functioning trains. In 1820 a Scotsman named Gregor MacGregor pulled off one of the most audacious cons of all time. MacGregor claimed to be descendant of Rob Roy and ancient kings of Scotland, and also claimed to have been granted a certain amount of land in what is now modern day Honduras. 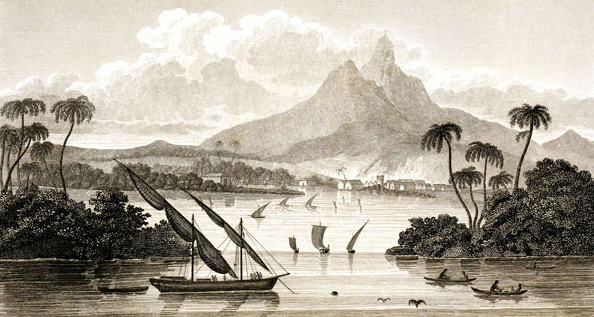 Calling his new (and entirely fictional) country “Poyais,” MacGregor began to solicit investments for his new, up-and-coming Central American country. The image below is a landscape of the supposed country of Poyais, taken from Sketch of the Mosquito Shore, a book that MacGregor penned under the pseudonym Thomas Strangeways. MacGregor promised that his land in the New World was filled with libraries, cathedrals, and a native population who were eager to welcome Europeans. There was nothing of the sort, and when colonists showed up in what is now modern day Honduras, they found nothing. For more on Scotland’s failure to have Central American colonies, check out Episode 20, The Lost Empire of Scotland. The Economist article cited in the episode, on why MacGregor’s investors could have been so credulous. This episode is a little different. About a year ago I was approached by a team of documentary film makers who were making a movie about Polybius, Portland’s mythical video game of doom. I’d previously spoken about Polybius at the Portland Retro Gaming Expo, and they asked if I would also like to talk about it on camera for the movie. I said yes. They set up an event at Velo Cult, a bike/bar/event space here in Portland, and I had a great time talking to people about a creepy nonexistent video game that, supposedly, did weird things to people’s brains. The Polybius Conspiracy is running a Kickstarter campaign to help with the funding of the film. If you want to see a movie about a legendary video game with me in it (and I hope you do) then consider giving them some of your dollars. Help fund the Polybius Conspiracy on Kickstarter. The post on coinop.org that started the whole Polybius myth. Polybius, a song by James Houston and Julian Corrie. Imagine a medieval dungeon. You probably imagine prisoners chained to the wall, a torturer in a black mask tormenting the occupants, several machines of torture such as the rack or the Catherine wheel, and, most imposingly, the dreaded iron maiden, a casket lined with spikes that would slowly bleed a prisoner to death in a grim mockery of an embrace. 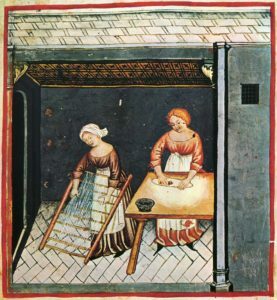 In all probability, though, the iron maiden was never an actual torture device, at least not in the middle ages. 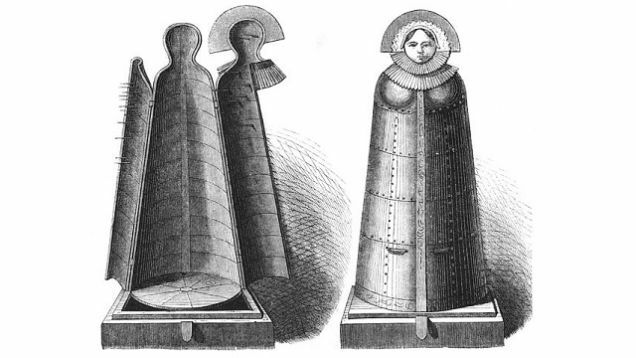 There may have been machines that resembled the famed spiked sarcophagus, but in all probability the most famous and feared resident of the medieval dungeon was probably a hoax dating back to the late 1700s. The Museum Scholoss Kyburg’s listing for their replica iron maiden. A reference to the iron maiden in the New York Times in 1863. Time Magazine on Uday Hussein’s iron maiden. One of the most persistent myths of the Middle Ages was that of Prester John, a mythical Christian king whose supposed domain was located beyond the eastern Muslim regions. Probably the most vivid portion of the myth is a letter received by the Byzantine emperor Manuel I Komnenos in 1165 claiming to be from the monarch. 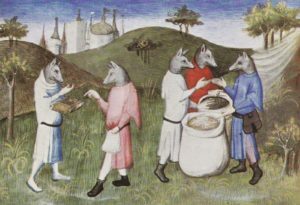 The letter (ostensibly written from one king to another, but with an arrogant, bragging tone that glorifies Prester John’s position relative to that of Byzantium) details a kingdom flowing with milk and honey, populated by fantastical animals such as centaurs and fauns, and featuring such wonders as Mount Olympus and the Fountain of Youth. Some writers, most notably Marco Polo, identified Prester John with the Mongols, and later versions of the story would move his kingdom to Ethiopia. Below is a 15th century painting depicting Ong Khan, a rival to Genghis Khan, as the legendary king Prester John. Prester John is profiled in chapter three of S. Baring-Gould’s Curious Myths of the Middle Ages from 1867. Prester John and Europe’s Discovery of East Asia from East Asian History, June, 1996. This YouTube video by a medieval studies grad student nicely illustrates the legend of Prester John with action figures. I have a serious amount of admiration for that kind of thing. Humans have pursued artificial intelligence, in one form or another, for generations. One of the most potent signifiers of intelligence has, historically, been chess. Even though the ability to play the game does not actually require as much cognition as, say, cooking or carrying on a conversation, the ability to play the game has been used as a symbol of intelligence, such as when Deep Blue shocked the world by defeating chessmaster Gary Kasparov in 1997. Probably the most famous artificial chess player was a fake. 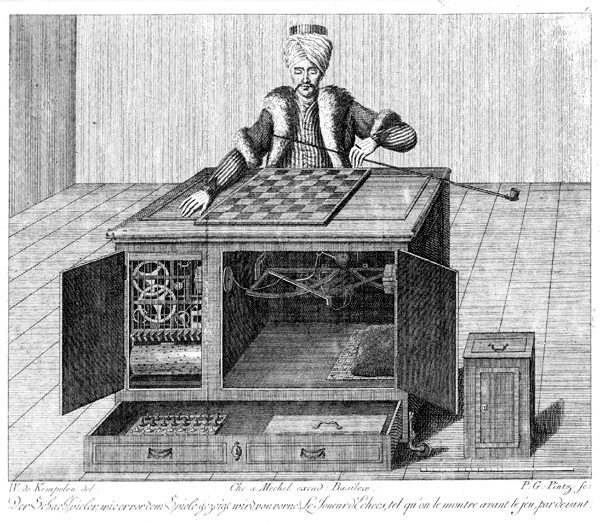 The mechanical Turk, initially built in 1870, appeared to be an automaton that could outsmart and outplay human beings. In fact, it was a human being. A living, breathing operator was nestled inside the Turk’s innards, controlling the game. Nevertheless, it remains one of the most famous illusions of all time. See a modern replica of The Turk in action. Tom Standage’s The Turk at Powells.com, the book that introduced me to the chess player, and annoyed me when I found out it was a hoax. Maelzel’s Chess Player by Edgar Allan Poe. The Turk was the inspiration for the 1927 silent film The Chess Player, about a fictionalized version of the Turk. The Turk lends its name to Amzon.com’s Mechanical Turk service, the subject of a podcast by NPR’s always excellent Planet Money.